1. Sometimes you just have to keep fighting. No matter how bleak it seems, no matter how weary your soul, you must keep one foot in front of the other, one sword held in readiness and keep fighting. Keep in mind the purpose of your goal, the people that matter, the life you must live. 2. No one is too small to make a difference. The small are often underestimated in their giant hearts, huge courage and large willingness to sacrifice. If you feel too small to matter, you're wrong. It may not seem your efforts are making a difference, but one person can make all the difference in the world. 3. The insurmountable can be overcome. Even when the problem is a fire-breathing dragon or a broken heart that doesn't heal or a situation that seems hopeless. Life is ever-changing and despair can be overcome. It may take pain, time or pouring out your soul to another, but it can be defeated. In it's place, hope can rise. 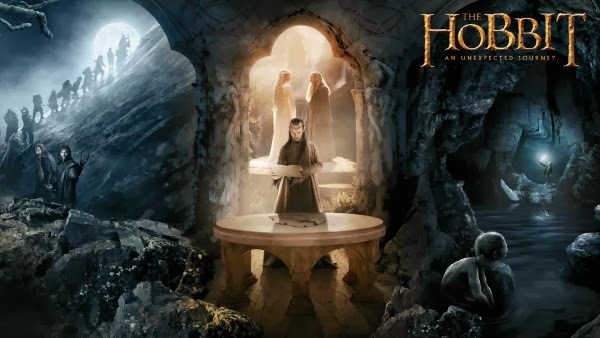 I love the Hobbit and I know there's been a lot of criticism about the movie being broken into three parts, but I'm really excited about it. I like that Peter Jackson is using supplementary material Tolkien wrote about the history of Middle-earth to add in what we don't see so much in just the book. And of course, I know there is Hollywood license to embellish, but still, I'm looking forward to seeing the next two movies, and the second is out today! CATHY. I LOVE THIS. God used "The Lord of the Rings" trilogy to speak to me about similar things. Big inspiration. Yes they are. Tolkien knew what he was doing!